I’ve been a landlord, have coached and trained landlords, and mediated their disputes for over 25 years during which time I’ve observed how they handle conflict. I’ve also been watching how landlords make concessions to tenants in order to build social capital. One thing I can say is that landlords will do better based on how well they meet tenants’ interests. This isn’t obvious given the popular view of landlord-tenant relationships as a zero sum game. The highest rent, fewest amenities and lowest maintenance, the most profit. Tenant losses equal landlord gains. At least until tenants exercise their rights or the city cracks down or the neighborhood protests, at which point landlord losses can skyrocket. And which landlords are at greatest risk? Those that don’t manage their properties well. After hearing thousands of landlords describe what works best with tenants, however, a different picture emerged. Landlords that effectively meet their tenants’ interests will better meet their own. Raising rents only moderately, meeting tenant needs, rewarding positive behaviors – will actually increase profits. Negotiations over eviction will go much better. Tenants will cooperate by letting contractors in, fixing up the property, keeping hallways clear and more. I wrote this book to help landlords succeed with this. I also wrote this book to help landlords avoid making mistakes when choosing to be flexible and good to their tenants. When landlords charge below-market rents, and allow late payments and extra roommates, often in exchange for landlord savings, everyone benefits – that is, until these situations are mishandled. Even if it’s in their interest to be flexible and good to their tenants, if poorly handled, landlords can lose not just thousands but their buildings as well! And their peace of mind! And tenants could become homeless! 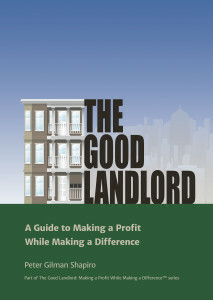 The Good Landlord offers practices, skills and tips for how to succeed with being flexible and good in order to do well. What is the basic idea behind The Good Landlord? When landlords meet their tenants’ interests in a way that also meets their own, they satisfy their enlightened self-interests. And when enlightened self-interests are satisfied, enhanced by building strong relationships, communicating effectively, and making concessions, landlords will not only save money but experience more control, personal satisfaction and peace of mind as well. call the police to stop break ins. and more based on how they’re treated. Tenants wanting decent housing at reasonable rents will usually fulfill their tenancy obligations in exchange. When tenants additionally get respected, recognized and rewarded by their landlords, they will do more to enhance landlord success. 1. DIY (Do-it-yourself) landlords. These are primarily small property owners, owning on average 9 units or fewer. Most don’t have professional property management, don’t know the relevant laws and regulations and don’t use lawyers to deal with eviction. 2. Tenants: These tenants value strong working relationships with their landlords in order to preserve decent, affordable housing. 4. Students, faculty and administrative staff in university real estate programs: All involved with training tomorrow’s real estate professionals will benefit from the principles and practices presented in The Good Landlord. 5. Non-Profit Housing sector: Nonprofit housing agencies across the country meet a wide range of affordable housing and human service needs for low-moderate income tenants and landlords for which The Good Landlord offers valuable advice. 6. Public Sector agencies including city planners, contract administrators, program and policy staff: These public officials will benefit by understanding what can enhance stabilization for landlords and tenants through this book. How is The Good Landlord different from other books on Real Estate? Many books tell you how to invest in rental properties, choose the right management company, or handle maintenance and finances. In this business, however, dealing with tenants is often the toughest part! Improving how you manage tenants requires more than knowing the laws and regulations, which is what most books present. Knowing the law is critical, but managing tenants also requires an ability to use your rights effectively. The Good Landlord presents a methodology for how to effectively use your rights to reach enforceable agreements that meet your needs, whether over tenancy changes or eviction, quickly and at lowest cost. How have these ideas specifically helped landlords? What’s an example of how these ideas have been applied successfully? My experiences applying the lessons of The Good Landlord have mostly been positive and profitable. Lessons I’ve applied from The Good Landlord have eased many management challenges and given me greater control while keeping my income up. Of course my tenants still request repairs and report noisy neighbors, but by meeting their interests, I’ve found tenants calling me to report issues with water leaks or electrical problems even when not affected directly. They’ve cut me slack if I couldn’t make repairs immediately. They’ve made minor repairs, landscaped, purchased supplies and cleaned up the premises not just because they enjoy their housing, but because they know I care about them as tenants. I know this because they tell me. When tenants know their landlords are meeting their interests, they will meet their landlords’ interests in kind which will enhance profits. Mike, a Good Landlord I describe in the book, offers an example of how to meet his tenants’ interests in order to meet his own. Mike rents his 20 units primarily to disabled veterans with section 8 vouchers given his own active combat experience in Viet Nam. Mike “appreciates what they’ve been through,” having served himself. He values giving back to the community not just by providing affordable, decent housing but by helping them access available services and benefits as well, which contributes to his 100% occupancy rate. A rubbish contractor himself, Mike has provided furniture for free for his tenants for years, often better than new, he boasts. Whereas other landlords in Mike’s situation could increase their rents beyond what Section 8 would allow, Mike keeps his rents within Section 8 maximums albeit with modest increases each year. His guaranteed rental income and do-it-yourself management approach have allowed Mike to make a reasonable profit over the years. He plans to keep doing this until his kids take over rather than convert his units to condos which would be more lucrative. He feels rewarded from the many appreciations he receives from his tenants, the cooperation he gets when scheduling repairs or conducting the rare eviction, and the fact that he is keeping disabled vets from becoming homeless. Don’t these Good Landlord practices work only in good times when the market is flush or for those landlords who you don’t depend heavily on their rental income? Although a landlord’s profit depends on income over expenses, good landlord practices will help whether or not the property is doing well. Landlords pursuing an eviction in which tenants are withholding rent and claiming defenses in court risk losing months of rent while paying legal and professional fees and property damage expense. What if these expenses were prevented because your tenant didn’t mount an all-out attack? Time and time again I’ve seen tenants maintain their tenancy obligations and avoid a fight when faced with eviction due to their positive relationship with their landlords. Whether landlord margins are small or large, they will gain from good landlord practices.